Work injuries are different. In Minnesota, when you are hurt at work, you instantly have several potential claims for medical treatment, lost wages, etc., against your employer’s insurance company and the policy it is required by law to have. Your injury rights arise from Minnesota’s Workers’ Compensation Act and are enforced through Minnesota’s Department of Labor and Industry (“DOLI”) and Office of Administrative Hearings (“OAH”). This is true regardless of fault, even if you caused your injury through your own negligence. In addition, for some work injuries, you may also have claims against a “3rd-party tortfeasor,” someone, other than your employer, who may have contributed to you getting hurt. Furthermore, if that “tortfeasor” is a medical provider, you may also have a medical malpractice case against that nurse/doctor/hospital’s insurer. Or you might have a product liability case against the maker (or maintainer) of a piece of equipment that malfunctioned. And your employer’s workers’ compensation insurance carrier, in turn, has claims against each of them. Sound complicated? It is. At least it can be. And it can be further complicated by facts specific to your medical history and/or history of prior work comp claims. That is why it is important that you hire an experienced attorney who understands how work injuries ... work. When you are hurt, the difference between a good recovery and a bad one can hinge on quick and timely access to medical treatment your doctor is recommending. And the last thing you need to worry about when trying to recover from an injury is how you are going to pay your bills and continue to support your family. Insurance companies are not on you your side. Their duty to maximize profits for their shareholders is at odds with their legal duty to pay benefits to you. If your treatment or pay is being denied or delayed because of “roadblocks” put up by your employer’s workers’ compensation insurance carrier, you need an attorney who knows how to fight back for you. You need an attorney who understands how the workers’ compensation system works and what to do when issues arise to get your case before a judge immediately, so that you and your family can move forward with your recovery, not worry about dealing with a claims adjuster who has objectives adverse to yours. Do not compound your already-stressful situation by making the mistake of hiring a lawyer who “dabbles” in the complicated area of Workers’ Compensation Law. 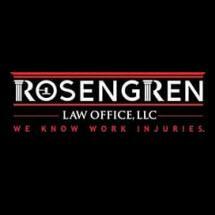 At Rosengren Law Office, we know work injuries. Founder Chris Rosengren has been selected for inclusion on the Minnesota Super Lawyers list for four consecutive years and is an Avvo 10.0-rated attorney who has represented injured workers exclusively since 2008. Prior to that, Chris spent eight years defending Wal-Mart Stores, Inc., against workers’ compensation claims in Minnesota. A former US Army airborne-qualified infantryman and Russian linguist, Chris founded Rosengren Law Office so that he could use the knowledge and insight he acquired through his years defending the world’s largest retailer to the advantage of injured workers. Regardless of the size of the company or insurance carrier you may be up against, Rosengren Law Office has the experience and know-how to level the playing field for our clients to ensure they get ALL of the benefits to which they are entitled. We never charge a fee unless we win ... and then our fees are limited to just 20 percent. Rosengren Law Office will NEVER charge you a fee unless we win your workers’ compensation case. When we win, we charge 20 percent of what we recover for you in benefits. Some workers’ compensation attorneys, even if they lose your case, will turn to you at the end for payment of their costs. Not us. Not ever. Likewise, many personal injury attorneys charge a contingent fee of one-third or more of what they recover for you. Medical Malpractice attorneys sometimes charge 40 percent or more. At Rosengren Law Office, our fee is limited to 20 percent of what we recover for you in workers’ compensation benefits. Additionally, if the benefit we recover for you is something other than wages (i.e., medical treatment or retraining/vocational help), our fee is limited to 20 percent of the value of the benefit we recover. And, in those instances, we will ALWAYS seek payment from your employer’s insurance carrier. Not from you. Not ever.